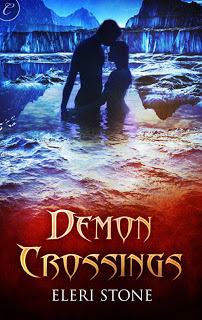 Enter to win an eBook copy of Demon Crossings! When you ask most people what they think of when they hear “Norse mythology” they say Thor. At least the people I know do and I think that’s a shame. After all, Norse mythology was Tolkien’s primary inspiration and he inspired most of the modern fantasy genre in one way or another. Gods and goddesses who can cross inter-dimensional bridges to walk among us. Giants and witches. Elves, dwarves, magical artifacts. The wild hunt. It’s such a rich mythology to be reduced to one man (and a god demoted to superhero at that). I’ve always been fascinated by Norse mythology, a trait I share with the heroine of my latest release, Demon Crossings. So when I decided to write a paranormal romance set in a small corner of my home state with strong Scandinavian roots, it was a no brainer where I was going to look for inspiration on the world-building. From the start, I knew I didn’t want a superhero world where Thor was walking around with a big hammer. I wanted all the heroism coming from relatable people making sacrifices and doing the best they could in a difficult situation. I wanted a small community bound by a shared heritage who fought with each other as fiercely as they cared for one another. And I wanted a world that felt both very ordinary and intrinsically magical at the same time. Demon Crossings is set in an isolated farming community in Iowa and the basic premise is that Ragnarök, the Norse apocalypse, has already happened. The Æsir, Norse gods, escaped the destruction of their world (Asgard) by fleeing to earth (Midgard). These Æsir refugees settled in clans along faultlines in the fabric of space where they’re still able to maintain some connection to their broken home and its magic. Over the centuries, they’ve intermarried with humans and their blood has thinned. Their power has diminished but the demons who destroyed Asgard are still able to occasionally break through the rift to hunt them. Into all this comes Grace, a woman who’s completely unaware of her Æsir heritage. She’s a Norn, a Norse fate, who’s able to see the present—find things that are hidden, know things that are happening in distant places. Aiden, the hero, needs her help to locate his lost daughter who was kidnapped by demons and taken back to Asgard. So, this isn’t the Asgard of comic books and video games. Or even the golden place of legend. In the world of Demon Crossings, Asgard is a barren world and the Æsir descendants who live in our world are diminished. They’re not gods…but they’re not quite human either. It’s about Ragnarök but I included it because “from the heavens fall the fair bright stars” is exactly how I see the fallen demigods of Ragnarok, IA. So, that’s how Norse mythology inspired Demon Crossings. What’s your favorite mythology? Although I’ll read just about anything, my favorite genres are fantasy and paranormal romance and that’s what I tend to write. I like the mystery of the hidden, the forgotten and the unknown, quietly strong heroines and honorable men, real conflict and people who are smart, strong and brave enough to meet it head on. I believe in love. The kind of love that binds people together and has the power to redeem. I love stories that remind you that even in the boring and stressful times you never really know what might happen next.